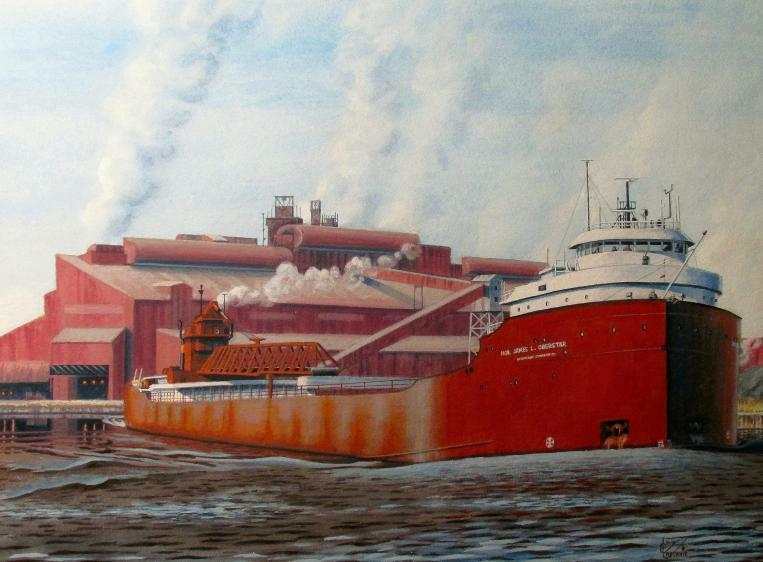 After delivering a cargo of iron ore pellets from the Lake Superior & Ishpeming ore dock in Marquette, MI, the Hon. James L. Oberstar is departing Ford Motor Company's massive Rouge Steel plant in Detroit via the Rouge River with a load of sinter. Since its purchase by Interlake Steamship Co. in 1967 from the Shenango Furnace Co., the Shenango II was then renamed the Charles M. Beeghly until 2007 when it was renamed the Hon. James L. Oberstar, esteeming the U.S. Congressman from Minnesota's 8th Legislative District. However, within days the boat was once again renamed the Charles M. Beeghly as Oberstar did not think it appropriate to accept the honor while he was a sitting Congressman. But in 2011 when Oberstar lost his re-election bid, the 806 foot vessel was once again renamed in his honor.